Nearly a hundred years after British and German soldiers imposed a temporary ceasefire along the Western Front to exchange holiday greetings and gifts, it’s time to declare a different kind of Christmas truce. 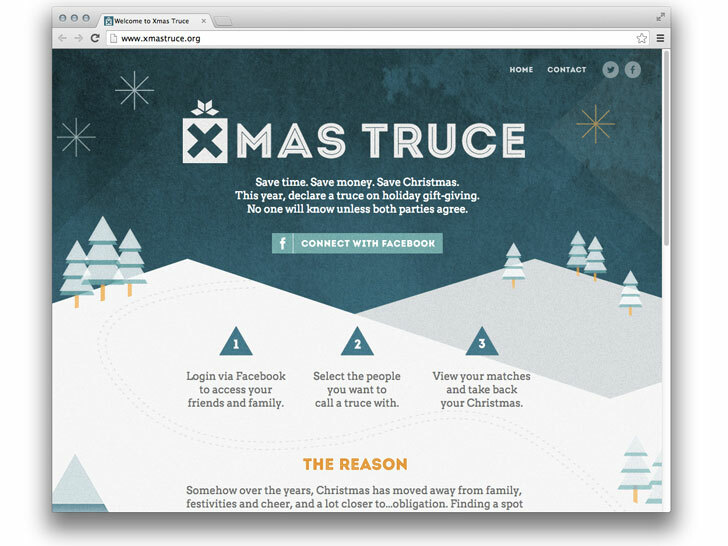 The brainchild of Saatchi & Saatchi’s London art director, Todd Grinham, “Xmas Truce” is an Facebook tool that allows you to impose a “truce” on gift-giving with your friends and family this season. Trucing works much like those secret-crush apps of yore, meaning no one will know until both parties virtually shake on it. The benefits of giving the gift of nothing? Less stress, debt, and quarreling with your partner over said stress and debt for one. “Somehow over the years, Christmas has moved away from family and cheer to…obligation,” Grinham writes. 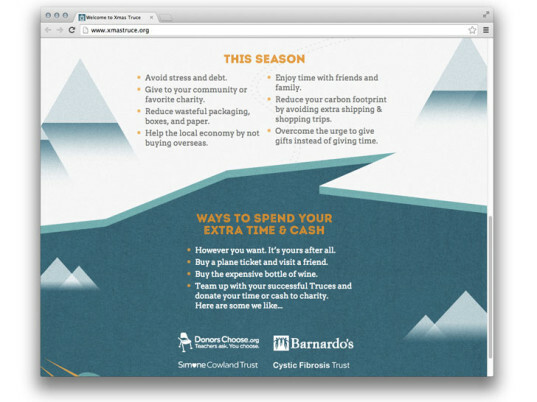 Another way to spend that extra moolah: Team up with your truces and donate your time or cash to charity. Grinham’s favorites include DonorsChoose, which helps classrooms in need, and the Cystic Fibrosis Trust. Nearly a hundred years after British and German soldiers imposed a temporary ceasefire along the Western Front to exchange holiday greetings and gifts, it's time to declare a different kind of Christmas truce. The brainchild of Saatchi & Saatchi's London art director, Todd Grinham, "Xmas Truce" is an Facebook tool that allows you to impose a "truce" on gift-giving with your friends and family this season. Trucing works much like those secret-crush apps of yore, meaning no one will know until both parties virtually shake on it. The benefits of giving the gift of nothing? Less stress, debt, and quarreling with your partner over said stress and debt for one.